CLICK IMAGES BELOW TO EXPAND OR VIEW SLIDESHOW. 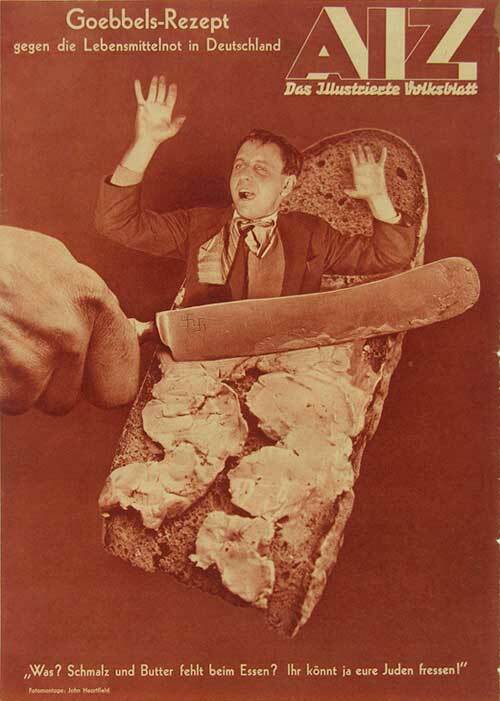 Heartfield mocks Joseph Goebbels “Recipe against the food shortage in Germany.” Heartfield creates a frightening prophetic image of disposing of Jews by rendering them into chicken fat (schmalz) and spreading them on bread. AIZ Back Cover, Oct. 24, 1935. 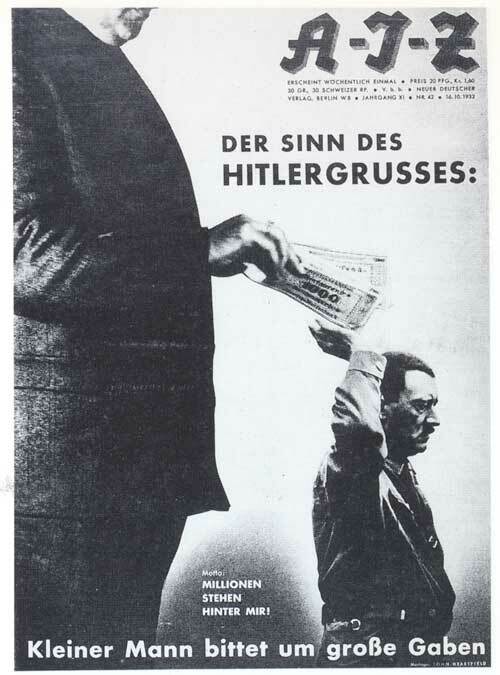 John Heartfield’s The Meaning Of The Hitler Salute. It’s “Millions (in cash) Stand Behind Him.” A relevant montage for our times, considering the power of outside money in politics all over the world. 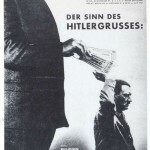 Heartfield was living in Berlin in 1932 when this widely circulated AIZ Magazine Cover appeared on newsstands throughout the city. 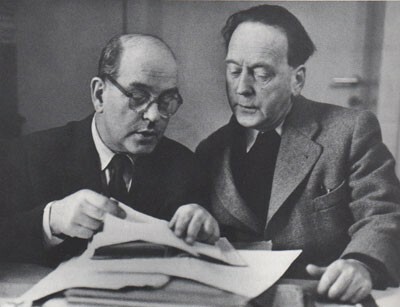 John Heartfield with his brother Wieland Herzfelde, 1952. Wieland was instrumental in the creation and distribution of Johnny’s work. They were close collaborators and best friends. Meral Bostanci writes about “Recipe Against The Food Shortage” and “The Meaning Of The Hitler Salute” in her article in WARHOLA Magazine 06. Meral Bostanci is committed to introducing John Heartfield photomontage to her native Turkey. Wieland Herzfelde Writes About Dada. 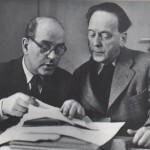 There wouldn’t have been John Heartfield Photomontage without the guidance and contribution of his brother, Wieland Herzfelde, and the courageous publisher of the AIZ magazine, Willi Münzenberg. Roland Box writes about his meetings with an elderly Wieland Herzfelde and the censorship of John Heartfield’s work. New sections and media are constantly added to the Exhibition. Meral Bostanci is a writer, art scholar, critic, and exhibition organizer. Meral was born and lives in Istanbul. She reveals how a twist of fate led her to learn of John Heartfield. She became determined to increase his recognition in Turkey. It’s a wonderful story of how discovering Heartfield’s life and work deeply affected her professional and personal life. Roland Box is a photographer and art scholar. He describes his meetings with John Heartfield’s brother and professional partner, Wieland Herzfelde, circa 1968. Mr. Box also comments on censorship during a West German Exhibition where swastikas were redacted from John Heartfield’s art. The John Heartfield Exhibition and Archive is fortunate to have the participation of art scholars and historians in German Art history. Material in the Exhibition is regularly reviewed by a group of noted art scholars and historians to ensure its factual content is as accurate as possible. There has been a recent resurgence in interest in Heartfield’s place in twentieth century German art history all over the globe. 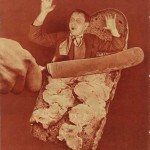 Heartfield photomontage and Dada art is being introduced to Turkey. His life and art is being revisited by art scholars in such countries as America, Turkey, England, and Russia. The Exhibition’s format always allows for modifications and additions. If you have a comment or contribution, please Write To The Exhibition’s Curator.